The Holiday Traditions Bouquet captures the essence of joyous celebrations this holiday season. 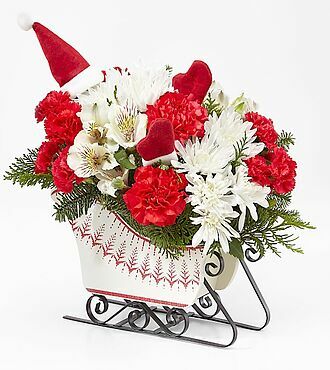 With an array of red roses, carnations, and white alstroemeria in a festive wooden holiday sleigh, this makes the perfect gift for every occasion this winter. STANDARD bouquet is approx. 12H x 9W. DELUXE bouquet is approx. 13H x 10W. PREMIUM bouquet is approx. 14H x 12W.